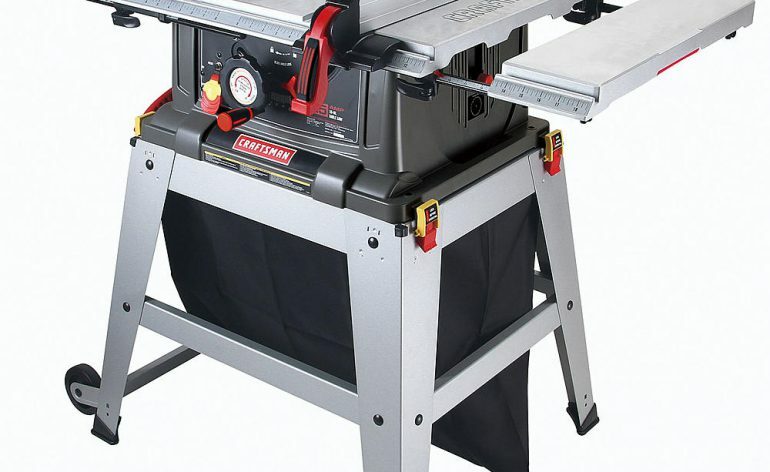 Today, I want to look at the Craftsman 21807 10 Inch Portable Table Saw. This is one of the cheaper portable table saws available, but Craftsman have managed to pack a lot of features into a budget table saw. 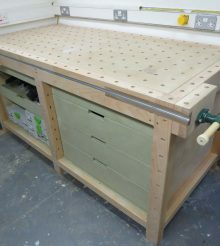 If you are a home/hobby woodworker then I recommend that you take a good look at what this saw has to offer as it may tick a lot of boxes for you. It has a laser mounted to the riving knife that projects a line on to your workpiece so you can line up your cuts easily. It also has a great wheeled base and a decent rip capacity. but there are a few things to be aware of such as the non standard miter slot and gauge. Don’t let this catch you out if you plan to use an after market miter gauge. The Craftsman 21807 weighs in at a respectable 63.8 lbs, which isn;t the lightest portable table saw around. That prize goes to the DeWalt DWE7480 which weighs in at a very light 48lbs. In terms of weight this saw is on a par with the Boasch 4100-09 which weighs in at 63 lbs. The Craftsman 21807 has two very good extension wings and also an outfeed extension which folds out to give you additional support when ripping long pieces of timber. The dimensions of the saw are 34.5″ wide x 58″ deep thanks to the fold up out feed table and measure 35″ high. the table size is 25″ x 19 5/8″ and features 2 extendable wings which means you get a 55 1/2″ wide surface, giving you a max rip of 24″ not only to the left of the blade, but also to the right. which I haven’t seen on any other portable table saw. This saw comes with a very sturdy steel base. It is very similar to the type of stand that is found on a lot of bigger contractor style table saws. It does have the additional feature of wheels on the left side allowing you to easily lift and move the table saw around your workshop or job site. The saw can easily be removed from the base with 4 clips (2 on each side) of the table saw. making it easier to transport and store . The Craftsman 21807 comes with a 36 tooth carbide tipped 10 inch blade with a standard 5/8″ arbor meaning you won’t have any trouble finding a decent after market blade. The 36″ tooth blade is perfectly adequate for rough ripping, but you will really notice a difference by upgrading the blade. This saw will accept a dado blade and you will be able to cut a maximum of 1/2″ dado’s. Many portable table saws are able to cut dado’s up to 3/4″. The saw comes with a pretty standard aluminium T-style fence. It runs smoothly on the rail and locks into place securely and square to the blade. 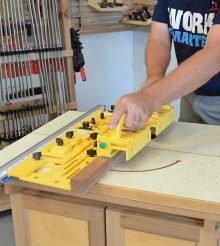 You need to be aware that the miter gauge and track is not the standard 3/4″ x 3/8″ so you won’t be able to use an aftermarket miter gauge (unless you make your own). 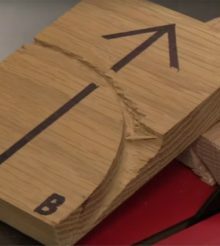 Now for most people this won’t be an issue as the supplied T-Style Miter gauge will be more than adequate for your needs. As with pretty much all portable table saw’s the Craftsman comes with a 15 amp direct drive brush motor. Its loud but light, which is why they are used. It has a max speed of 5000 rpm and you will find that it is powerful enough to deal with pretty much anything you throw at it, including thicker hardwoods. The Craftsman 21807 comes with a pretty standard modular blade guard, which consists of a plastic blade guard, riving knife and anti-kickback pawls. I have heard some reports of users of this saw feeling that the anti-kickback pawls are a bit stiff and in some case have marked the workpiece. The 21807 has a laser that mounts on the riving knife, which projects a line onto the table in line with the blade. This allows you to line your workpiece up with the line, giving you the confidence of an accurate cut. So what we have here is a very capable table saw at a very good price. If you are new to woodworking or looking for a table saw to help you with home renovations then for the price this may well be the perfect saw for you. It has a very good rip capacity, so can comfortably handle full size sheet materials and the out feed extension makes it a lot safer for longer work pieces. It comes with a basic dust bag collection system that fits to the underside of the saw. It’s not very effective and you will find that you end up with saw dust all over the place. I have mentioned before that the Craftsman 21807 does not have the standard size miter gauge so if you do plan on using after market miter gauges, you will be disappointed. but for all things considered this is a great table saw for the money. Thanks for your review. You’ve answered a few questions I had. My saw is about 5 years old and still running good. The miter slot is sloppy to me and I was going to find an aftermarket miter gauge but now I why I shouldn’t bother. I also agree with your comment about the dust collection bag.